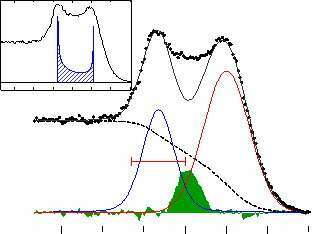 Spectral data from an ARPES study at Beamline 7.0.1 of Berkeley Lab’s Advanced Light Source revealed the two discrete peaks (blue for the holon and red for the spinon) that form the signature signal of a spin-charge separation event. The theory has been around for more than 40 years, but only now has it been confirmed through direct and unambiguous experimental results. Working at the Advanced Light Source (ALS) of the U.S. Department of Energy's Lawrence Berkeley National Laboratory, a team of researchers has observed the theoretical prediction of electron "spin-charge separation" in a one-dimensional solid. These results hold implications for future developments in several key areas of advanced technology, including high-temperature superconductors, nanowires and spintronics. The idea behind spin-charge separation is that electrons behave differently when their range of motion is restricted to a single dimension, as opposed to three or even two dimensions. When moving through one dimension, for example, the electrons are lined up head-to-tail, making the repulsive force between their negative electrical charges overridingly dominant. The restricted movement of electrons through one-dimensional material was expected to give rise to collective effects that would be strong enough to break the information flow of spin and charge from a single electron. ARPES is an excellent tool for observing spin-charge separation and other collective effects involving electrons. In this technique, x-rays are flashed on a sample causing electrons to be emitted through the photoelectric effect. Measuring the kinetic energy of emitted electrons and the angles at which they are ejected identifies their velocity and scattering rates. This in turn yields a detailed picture of the electron energy spectrum. Ordinarily, the removal of an electron from a crystal creates a hole, a vacant positively-charged energy space. This hole carries information on both the spin and the charge, as observed in a single peak of an ARPES spectrum. If spin-charge separation occurs, the hole decays into a spinon and a holon and two peaks in the ARPES spectrum are observed. ALS Beamline 7.0.1 utilizes a state-of-the-art undulator magnetic insertion device to generate beams of x-rays with properties similar to that of a laser. These coherent and tunable x-ray beams are a hundred million times brighter than those from the best x-ray tubes and provide an exceptionally high degree of angular resolution for ARPES experiments. Said Rotenberg, who manages the beamline and oversees research at the ESF experimental station, "At the ESF we have the advantage of being able to survey relatively large amounts of reciprocal space to locate where the interesting correlated effects are occurring. Our data not only shows a clear separation of ARPES spectral peaks, it can also be compared to theory to obtain spectral functions, which, in principle, can provide detailed information about the dynamics of spinons and holons." High-temperature superconducting copper oxides, or cuprates, with their ability to lose all electrical resistance at transition temperatures far above those of metal superconductors, have become valuable tools for research even though scientists still do not know why they work. Central to many of the leading theories that attempt to explain high-temperature superconductivity in cuprates is the existence of spin-charge separation in one-dimensional systems. Said Kim, "Our experimental confirmation of this spin- charge separation should provide more confidence in these theories." Another area in which spinons and holons could play an important role is in the development of nanowires, one-dimensional hollow tubes through which the movement of electrons is so constrained that quantum effects dominate. Nanowires are expected to be key components in future nanotechnologies, including optoelectronics, biochemical sensing, and thermoelectrics. Said Rotenberg, "The transport of electrons through nanowires will be subject to spin-charge separation and it will be very helpful to have experimental as well as theoretical understanding of this phenomenon as nanowire technology advances." The creation of spinons and holons in one-dimensional systems is also expected to have an impact on the future of spintronics, a technology in which the storage and movement of data will be based on the spin of electrons, rather than just on charge, as with our current electronic technology. Spin-based electronic devices promise to be smaller, faster and far more versatile than today's devices.